When this trailer crossed my path, it immediately drew me in. Not since 2010’s Insidious has this happened for me. Horror films aren’t my thing. More often than not I find them gimmicky, cheesy and predictable. While Insidious is my all-time favorite in the genre, Ari Aster’s feature film debut shook me to my core. Attention to detail warms my soul. Here Aster and crew supply it generously. A mindful trailer goes a long way, if you ask me. Neither too secretive nor too telling, Hereditary’s rollout was a tasteful display of cinematic craftsmanship. I just had to see this movie. And I’m happy to say that it did not disappoint me whatsoever. As a matter of fact, it exceeded my expectations. Although unaware until talking to my best friend, I was familiar with Toni Collette‘s work prior to Hereditary. The Oscar-nominated actress landed big roles in her career. She received a nod from the Academy for her supporting role in M. Night Shyamalan’s The Sixth Sense. However, I didn’t remember her from that film. It’s been a while since I’ve seen that one. But I do recall something else she was in. Collette starred in a Showtime series called United States of Tara from 2009 to 2011. In it she played a woman with dissociative identity disorder. When someone suffers from this disorder, they fluctuate between multiple personalities without warning. I never followed the show religiously. It takes a lot for a TV show to hold my attention. Yet her on-screen versatility impressed me. Ironically enough, the same exact disorder shows up in this new film. Collette plays Annie Leigh, a successful miniaturist. Her tight-lipped mother passes away as a result of multiple issues. One of which happens to be D.I.D. During her less-than-perfect eulogy Annie describes her mother, Ellen, as compulsive and distant. Their on-again-off-again relationship was due to Ellen’s pushy personality. She tried to control Annie’s life and her children. I gotta pause here, though. These facts about Ellen don’t come up until late in the first act. But let’s reverse a bit. As soon as this film opens, Aster’s nose for cohesive subtlety shines. The beginning shot frames a tree house just outside of the Leigh residence. It is where Annie’s young daughter Charlie builds crafts and occasionally sleeps. What stuck with me the most about this flick was its immersive camerawork. As I mentioned before, Annie is a miniaturist. Galleries publish and display her work. From the size of her home, those galleries compensate her generously. The camera pans away from the tree house, zooming with the utmost patience. Insert Peter, a teenage stoner disconnected from his family. He lays in bed on the morning of his grandmother’s funeral. His father, Steve, comes to wake him up. Before this moment, the camera zooms into one of Annie’s miniature sets. She creates scenes based on her real life. Her various works do an incredible job of foreshadowing. At the film’s genesis, it’s difficult to tell if Peter’s bedroom is miniature or life-sized. The creative direction here is phenomenal. 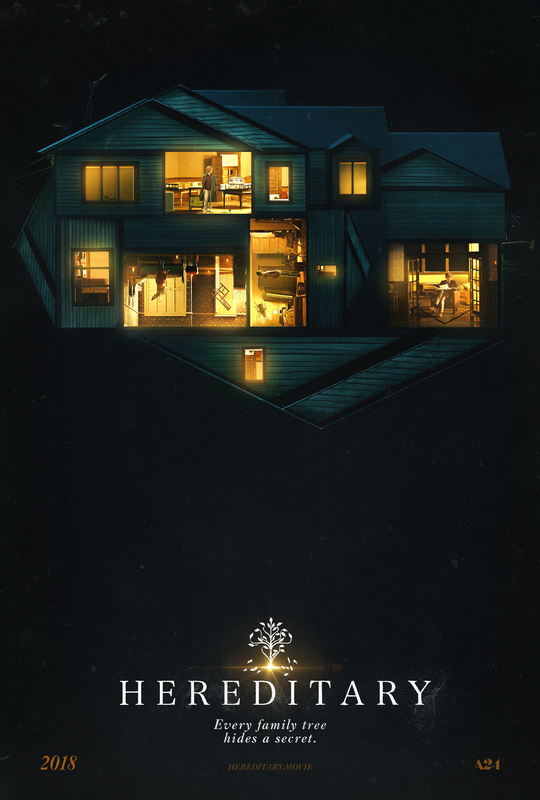 From the start, Hereditary is a meticulous feat of cinematic craftsmanship. Upon multiple views, bread crumbs become more apparent, as they should. However, their subtlety has a stylish brilliance. After my first theater visit, one element of this film bugged me. Ellen’s character never receives proper screen time. Annie talks of her past, but I thought the film could’ve used a flashback or two. Ya know, to aid with character development, and to flesh out Annie’s resentment. Though after a second viewing, I appreciated her physical absence. Throughout the film, the family matriarch creepily haunts her kin, whether directly or via an old friend. Ellen’s physical presence would have taken away from the mystique of her character. She needed to remain a spiritual entity to heighten the sense of realism. Although aspects of this movie aren’t entirely original — possession, betrayal, open seances — the storytelling here is superb. Additionally, this ensemble puts on a show. Toni Collette gives a top-10 performance of any I’ve ever seen. I certainly have not watched every movie out there. Nevertheless, this leading lady deserves yet another Oscar nod going into next year’s awards. Alex Wolff as Peter mostly impressed me. A shocking scene involving him and Charlie ends the first act. For spoiler purposes, I won’t say what that moment is. But I will say that it caught me completely off guard. If you’re looking for cheap scare tactics, you won’t find them here. As I mentioned earlier, horror films aren’t my cup of tea. They don’t frighten me. Their cliche tendencies simply bore me more than anything. Here, however, Aster’s knack for suspenseful progression separates his debut from other contemporary genre pieces. He shows that good intentions don’t always bring good results. Annie’s demonic downfall evolves from a simple wish to be normal, though her genes had other plans. By the end, the Leigh family feels destined to fail. Yet the journey to that conclusion satisfied my narrative thirst. Additionally, the dialogue reveals enough details in a natural rhythm that extra scenes weren’t necessary. I only had a couple of issues with this one. Despite my praise, an early flaw hinders this film’s overall impact. The pacing is rather sluggish. Now, that’s not to say Hereditary needed an extreme ramp-up. However, I caught myself zoning out briefly at times. Since I adhere to movie theater regulations, my phone stays in my pocket. But I can’t say the same for others. In these heavily distracted times, a film like Hereditary will not receive the love it deserves from the masses. Also, Alex Wolff annoyed me at times. While his performance proved noteworthy, his portrayal of fear occasionally took me out of the film. One moment he’s calm or only slightly afraid; the next he’s whimpering like a toddler. I understand spirits are terrifying. But I needed a bit more consistency from his performance. All in all, though, this film is one of the year’s best, and is worthy of hardware consideration.